Annually, the Canada Mint keeps the design of each next coin in the “Call of the Wild” series a secret, until the beginning of February of each next year. This is the 6th and last coin in the “Call of the Wild” (“Call of Nature”) series. • The SIXTH coin in the “Call of the Wild” series in 1-ounce 99.999% pure gold. 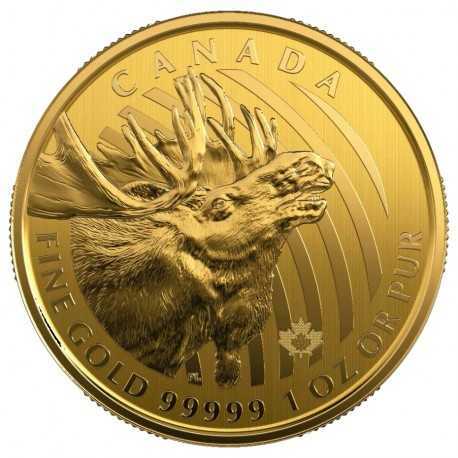 • Rendered in exquisite detail by Royal Canadian Mint engravers, this coin celebrates the moose. • Crafted in the Royal Canadian Mint’s exacting standard of 99.999% pure gold, the highest standard of pure gold available in the world. • Features a micro-engraved maple leaf laser mark in the coin’s field. In the centre of the mark, visible under magnification, is the numeral “19”, denoting the coin’s year of issue. • Signed by the RCM’s Chief Assayer, the assay certificate on the back of the card certifies the authenticity and purity of the coin. • Highest face value ($200 CAN) of any legal tender 1 oz. gold bullion coin.